Type Dual Pixel CMOS AF system. Phase-difference detection pixels built into imaging sensor. Dual Pixel CMOS AF is possible over an area of approx. 100% vertical and 88% horizontal of the frame. AF System/Points Maximum 4779 AF points. AF Point Selection Face+Tracking + Eye AF: Face and subject tracking via automatic recognition / manual selection via touchscreen. Automatic selection over AF points when no face recognised within frame. 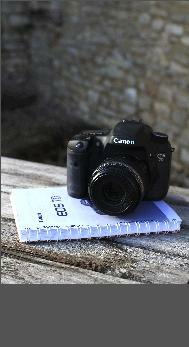 Manual Focus Select via AF/MF switch on lens. MF Peaking available. White balance compensation 1) Blue / Amber ±9 levels; 2) Magenta / Green ±9 levels. Type 7.5 cm (3-inch) ClearView II Touchscreen LCD (TFT). 3:2 aspect ratio. Approx. 1,040,000 dots. 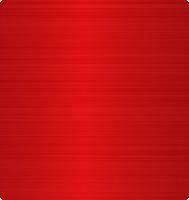 Electrostatic capacitive type. Vari-angle. 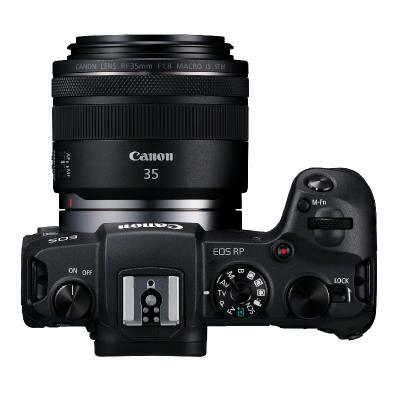 Firmware Update Update possible by the user (Camera, Lens, External Speedlite, BLE remote control, Lens adapter). 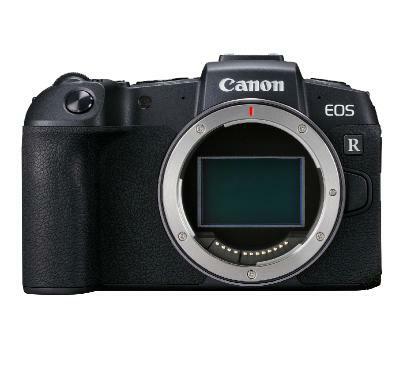 Canon today launches the EOS RP - a small, light and practical full frame mirrorless camera, for advanced amateurs looking to take a step-up into Canon’s revolutionary EOS R System. Ideal for travel, landscape and portrait photography, and videography, the EOS RP promises greater potential opening up all the benefits of the EOS R System – including the world’s fastest autofocus (1). 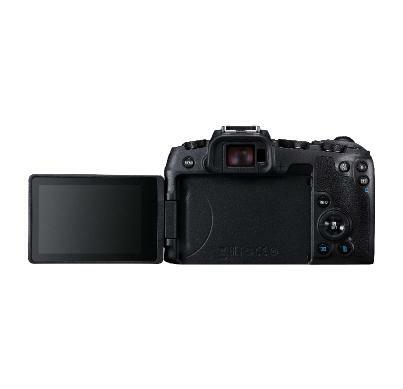 As Canon’s smallest, lightest (2) full frame digital interchangeable lens camera to date, it provides the ultimate blend of practicality and ease of use, with impressive image quality. The EOS RP also allows photographers and videographers to explore and utilise Canon’s full portfolio of EF and EF-S lenses. Today, Canon also announces the development of the RF 24-240mm f4-6.3 IS USM – the perfect travel companion – practical in both size and performance. 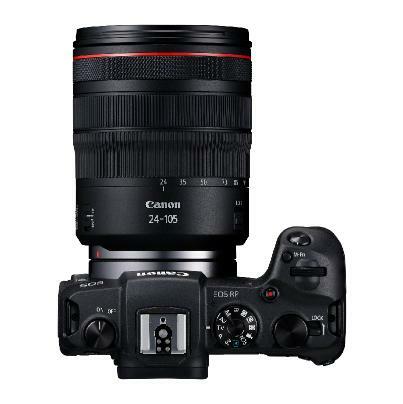 It is a versatile all-purpose lens for the advanced amateur photographer or videographer offering a range of focal lengths for capturing extraordinary shots. The EOS RP is an affordable yet advanced camera in Canon’s full frame line-up. 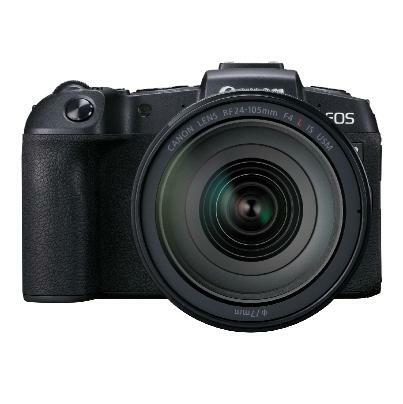 Offering next generation full frame optical performance with the potential to explore future RF lenses, such as the RF 24-240mm f4-6.3 IS USM, the EOS RP features the innovative RF Mount with its high-speed 12-pin communication system, short back focus and wide 54-mm mount diameter. Built from the ground up, the RF Mount provides lenses with new levels of optical performance, responsiveness and functionality. Photographers and videographers can also experience the full performance of their existing EF and EF-S lenses thanks to three EF-EOS R adapter options, with additional functionality when using the control ring adapter or drop-in filter adapter. The EOS RP’s 26.2 Megapixel full frame CMOS sensor, coupled with Canon’s latest DIGIC 8 processor, offers a creative step-up with the optimal balance of detail, control over depth of field and incredible low light shooting performance. 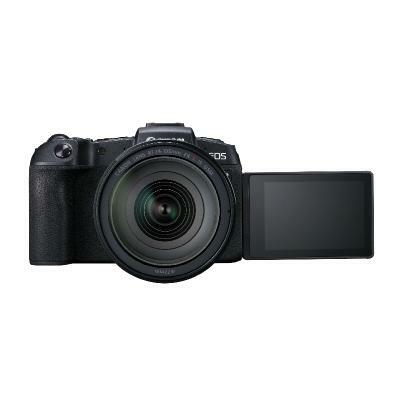 Optimised for low light conditions, the ISO 40,000 – expandable up to a range of ISO 102,400 – works alongside the powerful Dual Pixel CMOS AF system to enable photographers to shoot in even the darkest environments with confidence, with a shooting capability down to -5 EV (3). Portable and practical, the EOS RP is Canon’s lightest and most affordable full frame digital interchangeable lens camera launched to date. In a body weighing just 485g (4), it is great for travel when space and weight are at a premium. Engineered to shoot in a range of situations, the camera is built around a magnesium alloy chassis with high precision outer body parts, including sealing materials to provide dust and moisture resistance. 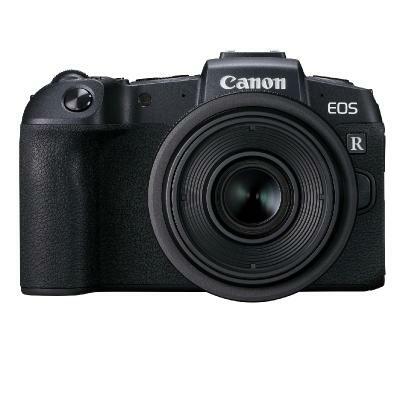 Versatile in its usage, the EOS RP offers a powerful Dual Sensing IS system that reduces camera shake for handheld photography, and a silent shooting scene mode for discreet shooting. A continuous shooting rate of up to 5 fps, or 4 fps with Servo AF, combined with a UHS-II card slot, gives an unlimited buffer (5) when shooting JPEG or RAW files – enough for capturing action when travelling. The EOS RP’s handling is both easy, familiar and comfortable to use with the flexibility of customisable controls, scene modes and a graphical menu interface – great for adapting to different skill levels, when shooting either stills or video. The well-designed, EOS-style grip, high resolution 7.5-cm Vari-Angle touch screen and 0.39-type OLED electronic viewfinder inspires next generation handling with full creative framing and tactile controls at one’s fingertips – from menu options to the point of focus. The EOS RP is compatible with a range of EOS accessories including the Extension Grip EG-E1 - which also launches today – for added comfort, and the Canon Speedlite 470EX-AI with AI bounce (launched February 2018). The EOS RP takes a no compromise approach to autofocus with Dual Pixel CMOS AF offering the world’s fastest AF speed of 0.05 seconds (6) and accuracy with up to 4779 selectable AF positions over a wide frame area of up to 88 per cent x 100 per cent. The EOS RP’s electronic viewfinder (EVF) – with 2.36 million dots and approximately 100 per cent coverage of the scene – allows great shots to be captured and previewed in challenging and diminished lighting. Touch and Drag AF is one of the four methods that makes it easy to control the focus area while framing using the viewfinder or simply touching the LCD screen. For impactful portraits, Eye AF with continuous tracking focuses on the subjects’ eye when in Face Detect mode, making it easy to achieve professional results and critical sharpness every time. Whether capturing moving subjects for stills or videos, the EOS RP can track the subject continuously to react to the action in the frame. For extended depth of field for macro shooting, focus bracketing allows for stunning depth of focus to be achieved ensuring ultimate sharpness. With a single press of the shutter, the mode continuously shoots with a range of automatically adjusted focal positions. Digital Photo Professional for PC or Mac can then be used for depth composition, creating a final shot which is in focus over the desired depth of field. Spot AF provides precise focusing when taking macro shots. Other AF modes include Face AF, 1pt AF, Expanded AF and Zone AF – providing flexibility for a range of subjects. The EOS RP delivers freedom and possibilities for videographers looking for a portable and easy-to-use camera. With its DIGIC 8 processor, the EOS RP can capture movies in up to 4K resolution at 25 fps and Full HD at 60 fps. With features including 4K time-lapse, interval timer, Movie Servo AF and HDR movies, users can capture fast action and slow-motion sequences as well as achieve an expanded dynamic range. Dual Pixel CMOS AF (7) enables accurate focusing and face detection, while Movie Digital IS provides 5-axis movie stabilisation to counteract shake when footage is captured handheld. The microphone and headphone jacks help to capture and monitor audio in real time, while the Vari-Angle touch screen makes it comfortable to shoot at a variety of angles. The Video Snapshot function is a simple way to create a video summary of a travel adventure, combining 4, 6, or 8-second clips to give a digest of memorable events and scenes. An easy to manage codec enables a swift editing workflow and reduced file sizes for storage. Canon today reaffirms its ongoing commitment to its recently launched EOS R System and RF Mount, announcing the development of six full frame lenses for release in 2019 in celebration of reaching a production milestone of 140 million EF and RF lenses (8). Included in the lens development roadmap is the RF 24-240mm F4-6.3 IS USM, the perfect travel companion – practical in both size and performance. This versatile all-purpose lens for the advanced amateur photographer or videographer, offers a range of focal lengths for capturing extraordinary shots. The five other full frame RF lenses currently in development suit the needs of every user from advanced amateurs to professional photographers and videographers, all in pursuit of the perfect shot. Building on Canon’s optical lens heritage, this range of lenses will push forward the frontiers of creative capture thanks to the new cutting-edge optics and advanced image processing for both stills and video. (8) 140 million milestone figure is the accumulated production as at 19th December 2018. Figure includes RF lenses and Cinema lenses.